Garmin nuvi 775T is designed with soft-touch technology for a premium quality look and feel, while its sleek and slim to fit comfortably in your pocket or bag. Get a new perspective on navigation the Garmin nuvi 775T. This state-of-the-art navigator brings detailed street maps for UK, Europe and North America and premium features like Lane Assist, 3D City View and landmarks, smart traffic avoidance, speed cameras, GPS HotFix technology and photo navigation. With stereo Bluetooth and enhanced phonebook and MP3 support, you can make and accept hands-free phone calls through the sat-nav screen and listen to navigation, calls and MP3s broadcast through your car stereo. Garmin nuvi 775T has been discontinued. Accessories, spares and parts are still available for your nuvi 775T, as are road maps. Get a new perspective on navigation with the Garmin nuvi 775T. This state-of-the-art navigator brings detailed UK, Ireland, Western, Eastern Europe and North America street maps and premium features like Lane Assist, 3D City View and landmarks, traffic alerts, GPS HotFix technology and photo navigation. With stereo Bluetooth and enhanced phonebook and MP3 support, make and accept hands-free phone calls through the sat-nav screen and listen to navigation, calls and MP3s broadcast through your car stereo. Garmin nuMaps Guarantee - simply register your new Garmin nuvi 775T within 90 days of first using your sat-nav to see if a free map update is available. See map coverage below for more details. Lane Assist guides you to the correct lane for your onward journey, banishing confusion on motorways and multi-lane junctions. Avoid the guesswork; as you drive, nuvi labels the lanes, with arrows indicating the correct choice for approaching turn and exits. It even shows the road signs on major motorways for a clear illustration of what lays ahead. With added Lane Guidance to preview up to nine lanes, it’s your own local expert, wherever you travel. Navigate your way to a new age in satellite navigation, with panoramic 3D City View. As you drive around major cities in Europe or North America, a 3D view of key buildings and landmarks adds to the realism of the navigation experience. Garrmin nuvi 775T comes preloaded with detailed City Navigator street maps for the UK, Ireland, Western, Eastern Europe and North America, with digital elevation mapping contour detail for a better understanding of the surrounding terrain. Rolling screen transition, accelerated map redraw and routing capabilities make screen zooming even smoother and ensure the navigation always matches your pace. Advanced route planning lets you save 10 routes, specify via points and preview simulated turns on the wide screen. In addition, Garmin nuvi 775T automatically sorts multiple destinations to find your most efficient route – optimising your journey to save time and fuel. Redefine your sightseeing with photo navigation. To plan trips to landmarks and attractions before you set off, choose and save location-tagged photographs from Google Panoramio on your nuvi in a wish-list of places to visit. Then, at your leisure, select a photo destination for turn-by-turn directions straight to the scene. Don’t lose your car in a car park. Garmin nuvi 775T automatically marks the position on the map screen. When it’s time to return to the car, Park Position Recall guides you back there on foot. Built-in travel tools include a JPEG picture viewer, world travel clock with time zones, a currency and measurement converter, calculator and more. Garmin nuvi 775T has an integrated FM TMC traffic receiver to help you steer clear of jams, accidents and roadwork's on your route. Traffic information is just a toggle away. Just flick between your main navigation screen and congestion information while Garmin’s expert navigation works with the traffic alerts to report on the tailbacks and suggest a better route around the delay. Garmin nuvi 775T comes with a lifetime subscription to traffic alerts for North America. Some countries, including the UK, require a separate premium traffic services subscription. Garmin nuvi 775T integrates A2DP stereo Bluetooth® with a built-in microphone and speaker. Pair with your compatible mobile phone to talk hands-free through the sat-nav and give the road your full attention. Simply dial numbers using nuvi’s touchscreen keypad and answer calls in a tap of the screen, with mobile phone integration. Enjoy convenient one-touch dialling for contacts and points of interest and drive safely and legally. Even listen to high-quality stereo music and navigation on your headset. The Garmin nuvi 775T, like all Garmin sat nav's, gets its speed camera data from the Cyclops speed camera database. The database provides advanced alerts to fixed, average speed, mobile, variable, temporary roadwork, red light and red light speed cameras. As you approach a camera, your device sounds an alert. Subscription charges apply. Click here to read more about the Cyclops speed trap database. The Garmin nuvi 775T has been designed to be plug and play, and as such can be transferred from vehicle to vehicle with ease. The Garmin nuvi 775T is powered via the supplied vehicle power cable which includes an integrated GTM 21 FM traffic receiver for real-time traffic updates. The Garmin nuvi 775T then attaches to your vehicles windscreen via the Garmin nuvi 775T suction cup mount. Alternatively using the supplied dashboard disk you can mount the suction cup mount on top of your dashboard instead. Garmin nuvi 775T comes preloaded with detailed City Navigator street maps for the UK, Ireland, Western, Eastern Europe and North America, with digital elevation mapping contour detail for a better understanding of the surrounding terrain. Rolling screen transition, accelerated map redraw and routing capabilities make screen zooming even smoother and ensure the navigation always matches your pace. Get the newest maps available and navigate with confidence with Garmin nuMaps Guarantee. Simply register your new Garmin nuvi 775T at my.garmin.com within 90 days of first using your sat-nav to see if a free map update is available. With Garmin nuMaps Guarantee, you'll be up-to-date when you hit the road. Looking for accessories and spares for the Garmin nuvi 775T? View the full range. All parts are genuine Garmin product and specifically designed for use with the nuvi 775T. Accessories available to purchase include a 4.3-inch black carrying case, mains power charger, a weighted dashboard mount and external GPS antenna. Along with these accessories, it's also possible to buy replacement parts such as vehicle charger. 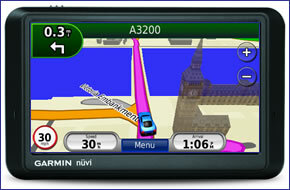 Looking for sat nav maps for the Garmin nuvi 775T view them all here. All mapping comes on microSD card with SD card adaptor and is genuine Garmin product and specifically designed for use with the nuvi 775T. Areas available to buy include: Southern Africa and Middle East and Northern Africa.